There’s no stopping Atherton Collieries in their pursuit of the Evo-Stik League West Division crown, according to Lee Ashforth. Clitheroe were well beaten by the title-chasers at Alder House, losing 4-0 as the hosts closed in on a third title in five seasons. Prescot Cables have mounted a late challenge, plugging the gap to make it a two-horse race, but Ashforth can’t envisage the leaders dropping another point from this position. The Blues were a goal down in Greater Manchester after just four minutes when man of the match Gareth Peet drew the foul from Hyuga Tanner inside the box after cutting in from the left hand side. The winger dusted himself down before firing the resulting spot kick past Ben Purdham, who got a hand to the ball as it nestled in to the bottom corner. The home side had their second of the afternoon in the 27th minute when Jordan Cover, with his back to goal, swivelled and smashed the ball in to the top corner from 25 yards out. And it was game over before the break. Connor Hughes supplied the delivery from the left hand side and Ben Hardcastle beat Purdham with a scruffy finish in the 36th minute. Colls completed the scoring just after the hour when Tom Bentham ran on to Cover’s clever back heel and finished neatly past Purdham. 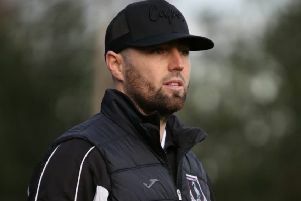 “I speak to a lot of managers throughout the league regularly and the consensus is pretty unanimous, Atherton Collieries have been the best team throughout the year,” confirmed Ashforth. “Prescot have had a late surge but for my reckoning Atherton will win the title without dropping another point. They are certainly the best team. “They’ve got that togetherness in the squad, which they’ve built up over the last two or three years. They’ve had a similar group of players during that time and just added to it. With just three games remaining, and safety assured, focus will slowly switch to next season as Ashforth looks to ring the changes. The Blues boss says he’ll be taking inspiration from other clubs in the division, including Atherton Collieries, to spin a new tapestry at Shawbridge. He said: “I try to pick up different things from different clubs to see what they’re doing right and how we can adapt that in to what we’re doing. “There are a lot of positives at our club that others will be looking at. We’ve been financially stable for a number of years now and that’s credit to Anne Barker inparticular. Ashforth added: “It’s been tough every step of the way this season. I’ve had to rebuild the team twice on one of the lowest budgets in the league. “We’ve lost a total of 18 points by conceding goals in the last 10 minutes of games. We’ve been scrapping to avoid relegation, which we’ve achieved now. “We’re well away from the bottom two at the moment and we’re desperate to stay away from there. We want to finish the season well and finish above Glossop North End if we can.